Provides methods for determining which mini-pets and mounts you are missing. Open up your companion window (pets or mounts) and click the scan button. This will open up another window which will allow you to see which companions you are missing, along with how to acquire them. There are currently no slash commands. Please use the bug reporting feature to submit bug reports. Do not contact us via Curse PM. Do not submit bug reports in comments. Feel free to join us on irc. There are no known issues at this time. Read the Bug Reporting and Feature Requesting information before submitting a bug report or feature request. Posting reports in the comments is not the place to do so. Comments are for questions on how to use the AddOn, or you can use the forums at WowAce. Please follow these small little instructions to make our lives easier. The easier you make development for Collectinator, the more time we will have to develop other AddOns. Please use the WowAce tracker to file bug reports. Posting bugs in the comments is not the place to do it. Please use the WowAce tracker to add suggestions and feature requests. Not all suggestions will be accepted: there are many people who use this addon, each with separate views. We will, however, try to make it as user friendly as possible...but when a decision is made please accept it. Please use the WowAce tracker to add suggestions and feature requests. If you have a request for integration, please submit a feature request at WowAce. 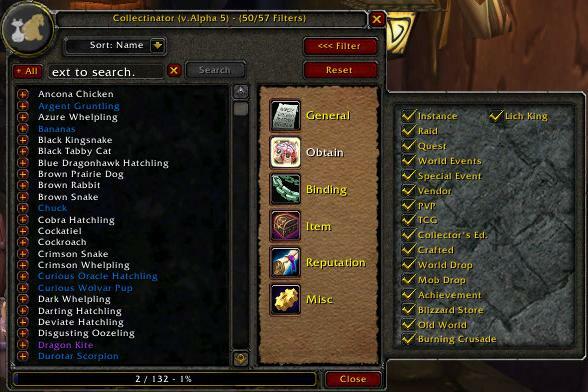 There is a limted API to interface with the Collectinator database. If you are a developer and would like more functions, please contact me on IRC. WooT! I had given up on an 8.x update for this addon. Thanks for your hard work. Currently it only works in 8.0 Theres no actual 8.0 data in it just yet. I'm still working on that. The next update should have that. What extra info was removed? Looks like at some point, the extra info in GameTooltip was removed from Collectinator. I get this feature request from Rarity users a lot, and I had been pointing them at this add-on. It's fairly easy for me to add to Rarity, since I already have all the data. I'm going to go ahead and do that in an upcoming build. The link for the above seems to go to a 403 Forbidden page? Saw this by way of a poll while downloading the recipe list, which I haven't had installed since several xpacks ago and I started fresh (and then forgot about it etc). Please cross link it visibly somewhere where I will be able to see it when I go to download updates to recipe list. I do everything manually, once every 3-5 weeks... so I'll be sure to see it. Another way to raise visibility might be a low impact non-offensive (don't know if you did this already haven't installed recipe list yet) ad or cross link button from recipe list to this addon. thanks thanks thanks for this Addon. I already loved Recipe List, so this can be only good. I'm using Collectinator on a french wow and when I hover over a name in the list, the tooltip that shows up keeps flashing. Is this a computer problem (does the same on two computers) or is there some kind of wrong code somewhere? Just like Ackis Recipe List. this seems to be another great and useful addon. Thanks very much for all your time and effort...it's certainly appreciated. Xarki,this is alpha software, if you have a bug/issue please report it in a ticket. Is the release version on Curse.com working? first off all, really really love the idea of this addon!!! great job dudes!! "Mount with ID 66088 not in database"
alpha 2 on curse does not work period. Swatter grabs 19 errors regarding missing errors in a bunch of files on login and /collectinator does nothing. there are a few other people on curse page stating same thing. Actively being worked on again. :) Working alpha for mini-pets is out now. It's because I haven't finished yet, give me time this weekend. this one isn't working for me at the moment. it starts alright atleast i can see about window under config but when i press on filter or anything else it drops error and end. Might be because i'm EU ? Or problems because of too many other addons running ?